Our logo tells a story. Individually, its components reflect our core values. Together they illustrate our commitment to improving health outcomes for people with developmental disabilities so that they can live successful lives in the community. 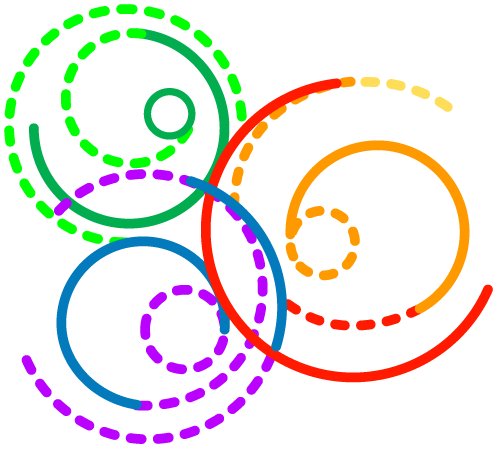 Circles, which form the base of our logo, represent focus, unity, movement, inclusion, and wholeness. Their rainbow colors celebrate neurodiversity. The circles link symbolizing the numerous individuals, friends, family members, agencies, organizations, and systems that make-up circles of support. The dotted-to-solid lines keep the focus on the individual, and place patients, caregivers and supporters at the center of the circle.